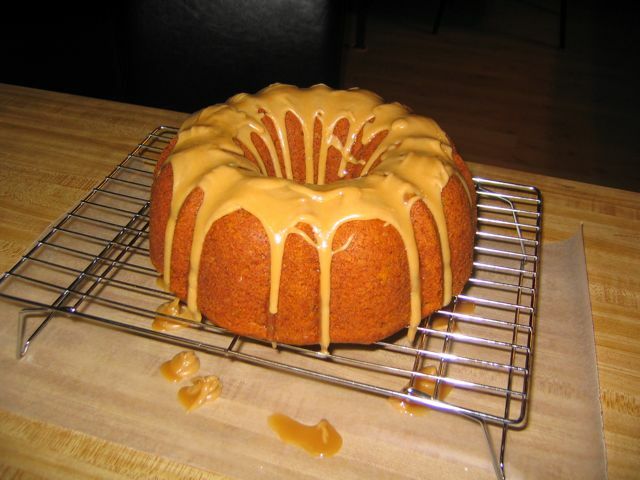 bundt take for ROSE’S heavenly CAKES: Pumpkin Cake (page 125), done by my youtube student! happy thanksgiving everyone, i have a lot to thank for this season. it is almost 10:30 am and i need to rush to make my cappuccino, otherwise i loose chances to get my italian passport! HOWEVER, i am stopping and post this for you to enjoy. my friend Deanna just baked the Pumpkin Cake. this cake is gorgeous unfrosted, where you can shine the unique pumpkin color and clean flavor. cake like this can easily make pie making out of fashion! 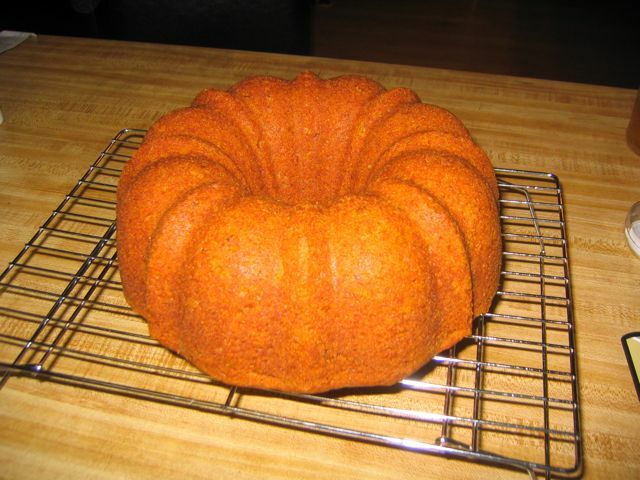 Deanna used a 14-16 cup bundt pan, she reports to have made a 1.5 batch of the recipe to obtain this picture perfect shape. i am eager to taste a slice! there isn’t a biggest reward than when one of your students bakes something they learned, indeed two students as Corey and her teen soon are baking one, too! adding, have your children break the walnuts by hand, which makes much cleaner and delicious whole pieces than chopping with a knife! and here is the cake frosted with only the Caramel Creme Anglaise component on the same recipe. Deanna said she was so exited i loved the picture of her cake, that she couldn’t go to sleep so she made the creme anglaise! her children were so stunned when i had them taste and smell the caramel creme anglaise i had prepared for our silk meringue episode. life doesn’t bet getter than this, don’t you agree? J and K made the Pumpkin Cake totally on their own today, I just chopped the walnuts because we didn’t want any accidents. It came out perfectly. Everyone was so impressed that the kids made such a delicious creation all on their own. I’m not sure if they really believed that they did it, but we know that they did! 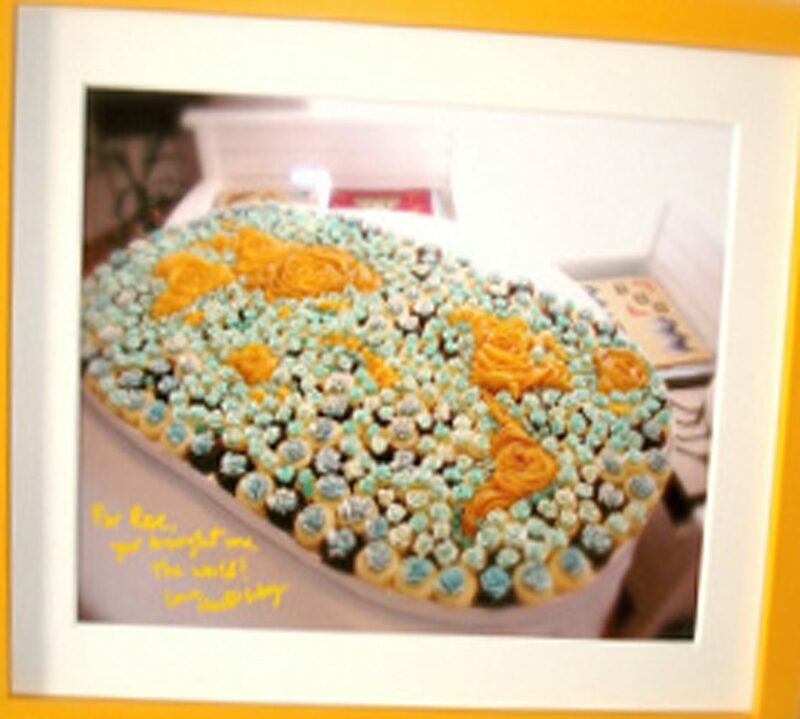 It’s great that I could step back and let them fly on their own, thanks for the baking lessons! you can have kids break the walnuts by hand with their small fingers, it is safe and the quality is higher than using a knife! Corey and children, i find your count believable unbelievable. so pleased you reported, it makes my thanksgiving very much thankful for.